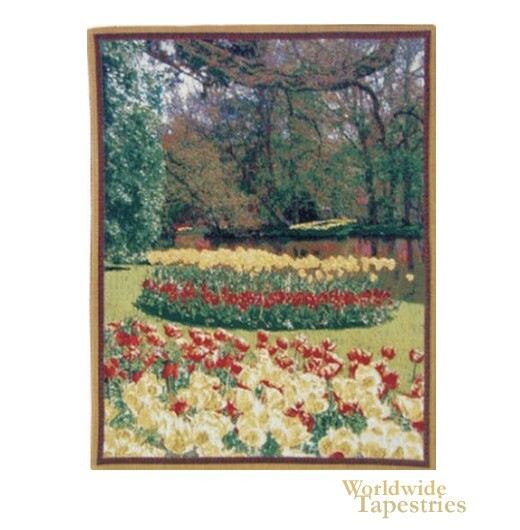 This Kuekenhof II MIni tapestry shows a closeup of a scene from the famous gardens in Holland. The bright yellow blooms contrast with the red and the lake is seen beyond with a background of tall trees. The scene is brightly lit with the sun and creates a scene to celebrate the height of spring. This Kuekenhof II Mini Panel tapestry is backed with lining and tunnel for easy hanging. Dimensions: W 18" x H 21"